Working at the computer, tablet or smartphone is often a pain in the neck. Young adults who are digital natives and work with computers and mobile phones experienced frequent pain, numbness or aches in their neck and more than 30% reported aches in their hip and lower back. In addition, women experienced almost twice as much aches in their necks than men (Korinen and Pääkkönen, 2011). Similarly findings have been reported previously when Peper and Gibney observed that most students at San Francisco State University, experienced some symptoms when working at their computer near the end of the semester. At work, many employees also experience exhaustion, neck, back and shoulder pains when working at the computer. 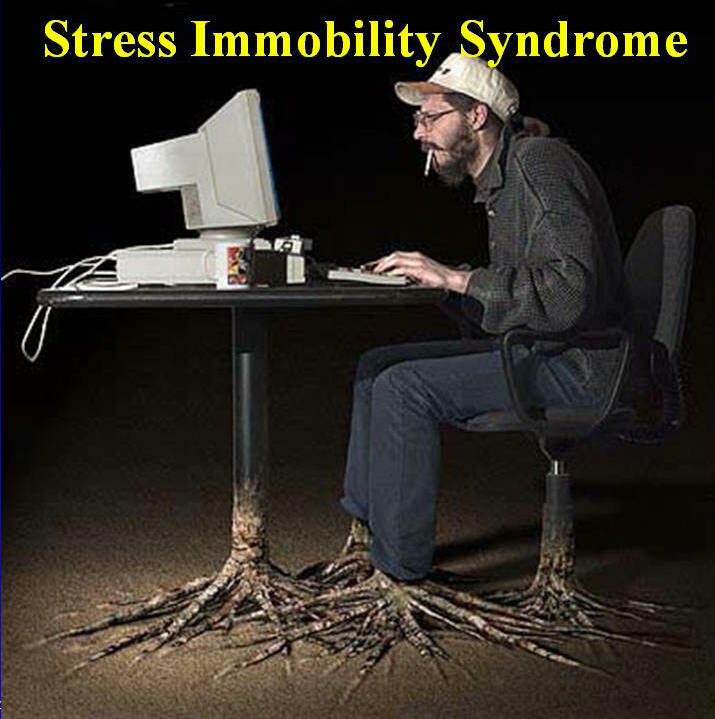 Although many factors contribute to this discomfort such as ergonomics, work and personal stress, a common cause is immobility. To prevent stress immobility syndrome, implement some of the following practice. Every hour take a 5-minute break (studies at the Internal Revenue Service show that employees report significant reduction in symptoms without loss in productivity when they take a 5 minute break each hour). Take a short walk or do other movements instead of snacking when feeling tense or tired. Perform a stretch, strengthening, relaxation, or mobilization movement every 30 minutes. Install a computer reminder program to signal you to take a short stress break such as StressBreak™. Perform 1-2 second wiggle movements (micro-breaks) every 30 to 60 seconds such as dropping your hands to your lap as you exhale. Leave your computer station for the 15-minute mid-morning and mid-afternoon breaks. Eat lunch away from your computer workstation. Stand or walk during meetings. Drink lots of water (then, you’ll have to walk to the restroom). Change work tasks frequently during the day. Move your printer to another room so that you have to walk to retrieve your documents. Stand up when talking on the phone or when a co-worker stops by to speak with you. I never felt that thinking about my work affected my body. I was totally surprised to see my body’s reaction on the computer screen. I now realized how I contributed to my illness and could see other ways to change and improve my health. The feedback made the invisible visible, the undocumented documented. Use of words, biofeedback and somatic feedback to transform illness beliefs. Many clients are unaware how much their thoughts and emotions affect their physiology. The numbers and graphs on the computer screen show how the body is responding. Seeing the changes in the physiological recording and the immediate feedback signals are usually accepted by the client as evidence, whereas the verbal comments made by a therapist might be denied as the therapist’s subjective opinion. The feedback is experienced as objective data—numbers and graphs ‘‘do not lie’’—which represents truth to the client. Clients seek biofeedback therapy because they believe the cause of illness is in their body, and then the biofeedback may demonstrate that emotions and cognitions influence their somatic illness patterns. This process has been labeled by Ian Wickramasekera (2003) as a ‘‘Trojan Horse’’ approach. Biofeedback and somatic feedback exercises provide effective tools for changing illness attributions and awaken the client to the impact of thoughts and emotions on physiology. Whether the feedback comes from a biofeedback device that records the covert physiological signal or is subjectively experienced through a somatic exercise, the self-experience is a powerful trigger for an ‘‘aha’’ experience—a realization that mind, body, and emotions are not separate (Wilson, Peper, & Gibney, 2004). Clinically, this approach can be used to facilitate changing illness beliefs and to motivate clients to begin changing their cognitive, emotional, and behavioral patterns. Clients begin to realize that they can be active participants in the healing process and that in many cases it is their mind-body life patterns that contribute to illness or health. For more information, case example and detailed description of a somatic feedback practice, download a pre-publication of our article, The Power of Words, Biofeedback, and Somatic Feedback to Impact Illness Beliefs. *Adapted from: Peper, E., Shumay, D.M., & Moss, D. (2012). Change Illness Beliefs with Biofeedback and Somatic Feedback. Biofeedback. 40(4), 154–159.